Do you want to learn how to can food? I explain the simple steps and you can start home canning right now. If you have a hobby farm, or a small container garden - these tips are for you. These fruit canning recipes and vegetable canning recipes are worth their weight in gold. Grandma's sweet and sour pickles, homemade jams and jellies, marmalade, horseradish and much more below. 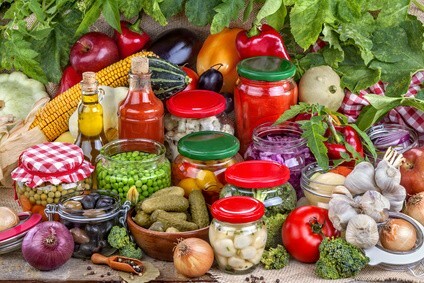 Fruits and vegetables selected for canning should be of excellent quality without bruises or blemishes and as fresh as possible; under-ripe rather than over-ripe. Can each variety in season, when it is best and cheapest. It is not necessary to can large quantities of food at a time. Two to three pounds of fruit or vegetables will fill a quart jar. For a small family or couple, use pint jars. 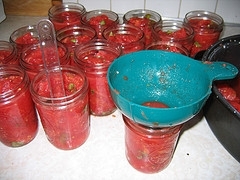 There are three principal steps in canning: preparing (prep) the food, packing it into jars, and processing the jars of food in boiling water, by pressure or by steam. Used for fruits, this method is not advised for vegetables at all - except tomatoes. 1. Pack fruits raw into hot sterilized jars. 2. Pour hot syrup over fruit, or hot, salted tomato juice over tomatoes. 3. Allow 1/2" to 1" head-space at the top of each jar to allow for expansion during processing. 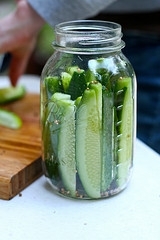 Remove air bubbles by running a table knife around the inside of the jar. 4. Adjust new scalded rubber rings and tops. Wipe clean with a damp clean cloth and seal jar according to type being used. 5. Process for the length of time indicated on canning chart. Used for all low-acid vegetables. May also be used for fruits and tomatoes. 1. Precook fruits in syrup; vegetables in boiling water. 2. Pack while hot into hot, sterilized jars. 3. 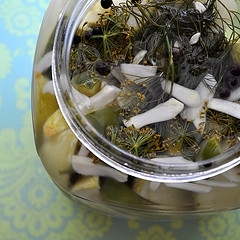 Allow 1/2" head-space at the top of jar if food is to be processed in a water bath; 1" if processed in a pressure cooker. 4. Remove air bubbles by running a table knife around the inside of the jar, and seal according to the type of jar being used. 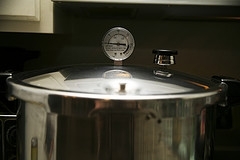 in a boiling water bath in a pressure canner or pressure cooker by steam in a pressure canner All other vegetables must be processed under pressure in a pressure canner or pressure cooker. Use a large kettle or stock pot that has a tight fitting cover and a rack to raise the jars off the bottom to allow water to circulate around them. A rack may be made using perforated cake tins, wire broiler racks, cooling racks or even thin pieces of wood nailed together. 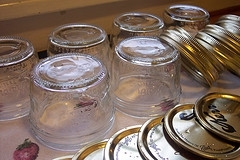 Wire baskets to fit individual jars may also be used. The pot should be deep enough to permit and inch or two of water above the jars. Have water in vessel hot for cold packed foods, and boiling for hot packed foods. Lower jars slowly into water. Be sure they are at least 1/2" apart. Cover container. If necessary, add more boiling water during processing. Check canning chart for times. 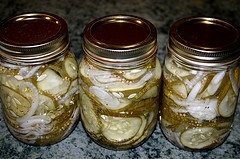 Remove jars from water and complete seal if necessary. Cool standing upright on a rack or cloth away from drafts. Please follow manufacturers instructions when using your canner. Pint jars may be processed in a pressure saucepan, adding 20 minutes to processing time. 1. 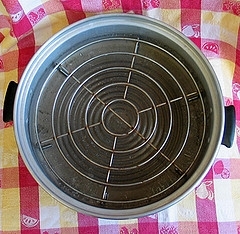 Place 2" to 3" of water in the bottom of the pressure canner, to the level of the rack. Have water hot for cold packed food, and boiling for hot packed food. If food is to be processed longer than 1/2 hour, a little more water is required. 2. Place filled jars on rack, and not to close together. Cover. 3. Bring to specified pressure, then start counting the processing time indicated in my processing charts. 4. When processing time has been completed, turn off the heat. Do NOT open the canner until pressure registers zero. 5. Wait two minutes, then open petcok gradually. Remove cover from canner, tilting, so steam can escape away from your face and hands. 6. Remove jars and complete seal if necessary. Cool upright on cloth or rack, away from drafts. This method may be used for fruits, tomatoes and sauerkraut. NOT recommended for other vegetables. 1. 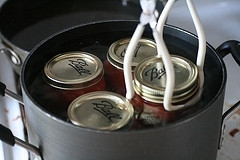 Arrange jars on rack in the pressure canner, and add hot water to shoulders of jars. 2. Cover canner, leaving the vent open. Bring water to a boil. 3. Count processing time from when the steam pours steadily from the open vent. Time requirements are the same for the boiling water bath on my canning chart. Jars, tops and rubber rings must be in perfect condition. Even the smallest flaw may cause the canned food to leak or spoil. Fill jars with water, adjust and put on rubber ring and cover, then invert. If the jar leaks, it is imperfect. Fit top to the jar. If the top rocks when tapped, it should not be used on that jar. The upper clamp should not be too tight or too loose. Bend it until it goes into place with a tight snap. Use only enameled, lacquered, zinc porcelain-lined or glass-inset tops. Screw the top on tightly without the rubber. If your thumb nail can be inserted between the top and the jar, the top is defective. Buy new ones every year. Fold the ring and press tightly. Then turn it over and reverse; folding in the same place. A perfect rubber will show no crease or break. Wash jars, covers and rubbers. Place jar on their sides in a pan of cold water; bring to a boil and boil for ten minutes. Covers, (except the self-sealing type with sealing compound), may be sterilized with the jars or separately. Let stand in hot water until time to fill. Lift with sterilized tongs or a skimmer and invert on towel to drain. Boil rubbers for only 2 minutes; no more. Cups, spoons, and other utensils should be dipped into boiling water to sterilize. Check the manufacturers instructions for other types of jars and closures. After processing, lift jars from the canner one at a time. Complete seal at once if the jars are not the self-sealing type. Place jars with freshly canned fruit or vegetables upright on a cloth or board with spaces between so they can cool quickly. Shield from drafts to prevent cracking. Tip the jars to test the seal. If jars leak, remove cover and examine. If cover is not perfect, use another which has been sterilized. If you were using the cold-packing method, screw on loosely and process or sterilize again 10 minutes. If the cover was perfect and the rubber was NOT perfect - place a new rubber on the jar, replace the cover and sterilize for 10 minutes. If the rubber is bulged out, press rubber back in shape while hot and invert. If the jar leaks, place a new rubber on the jar and sterilize 10 minutes. The next day, or when the jars are cold, test by turning the jar over in your hands. Or, if the jar has a flat, metal lid, test it by tapping the center of the lid with a spoon. A clear ringing sound means a good seal. The lid will be curved slightly inward. In both the Hot Packing and Cold Pack Methods, self-sealing caps are screwed on tightly. When jars have been tested and are ready to be stored, wipe them clean with a dry cloth and label with the contents and date.